I started work on the giant map a couple of years ago now, and finished the stitching and painting around May last year. You can read about the making of the project here. The only thing that remained to do was to start marking on the canvas the places I'd been, and I'd been pondering ways to do that for a while. I wanted to something simple and practical, so that I would be able to add new places quickly, but I also wanted it to look pretty. 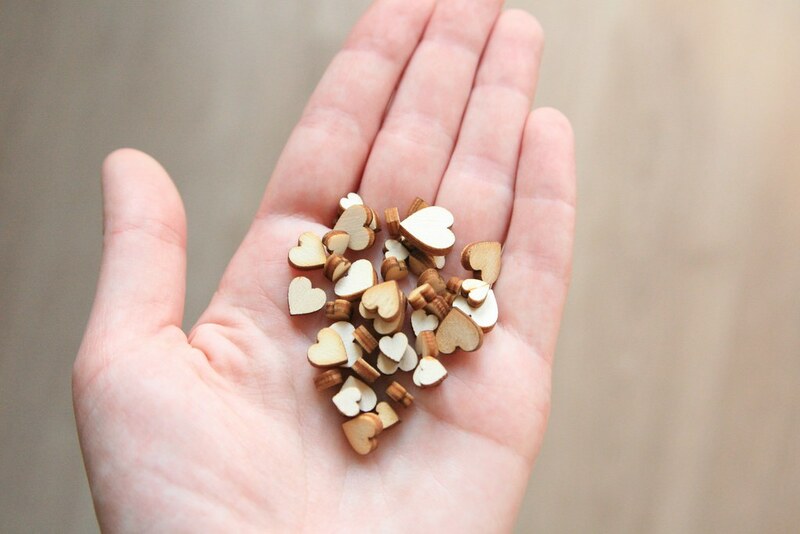 In the end, I settled for using these little wooden hearts. I can glue them straight onto the canvas, which is very quick and easy, and I already have lots of them in my stash that I use for scrapbooking. Actually, I fist picked up a little packet of these at a show from a company called ArtCuts, and loved them so much I went online and ordered lots of packets. I use them consistently on almost all the scrapbook pages I make as I still think they're lovely: pretty and delicate without being too in-your-face cutesy. So it seemed like a good idea to use them as map markers. Each pack has a mix of sizes which really appealed for this project. 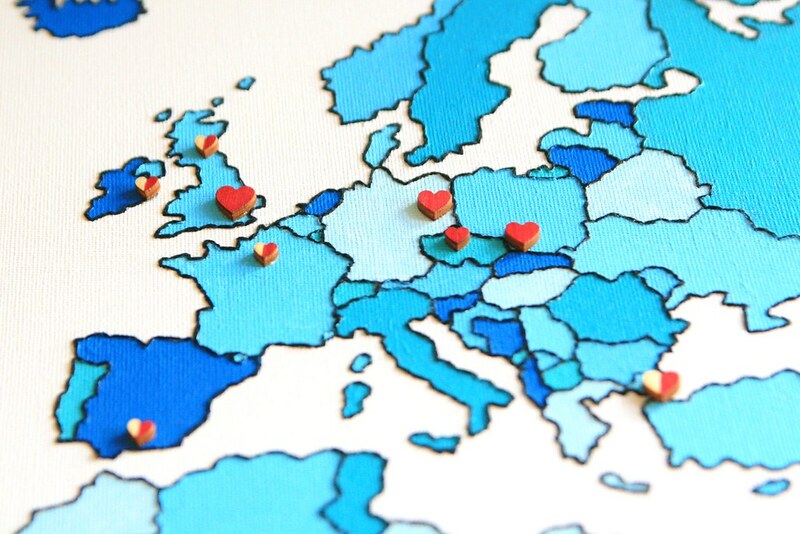 I used tiny hearts for places I have visited only briefly, or perhaps when I only visited one city in a country, and slightly larger ones to mark countries and locations where I have spent more time, or explored further. Then I used a heart one size larger still to represent our home in London. I wanted to create a way to mark not only the places on the map that I have visited, but also the places the man has visited, and places we've both visited. 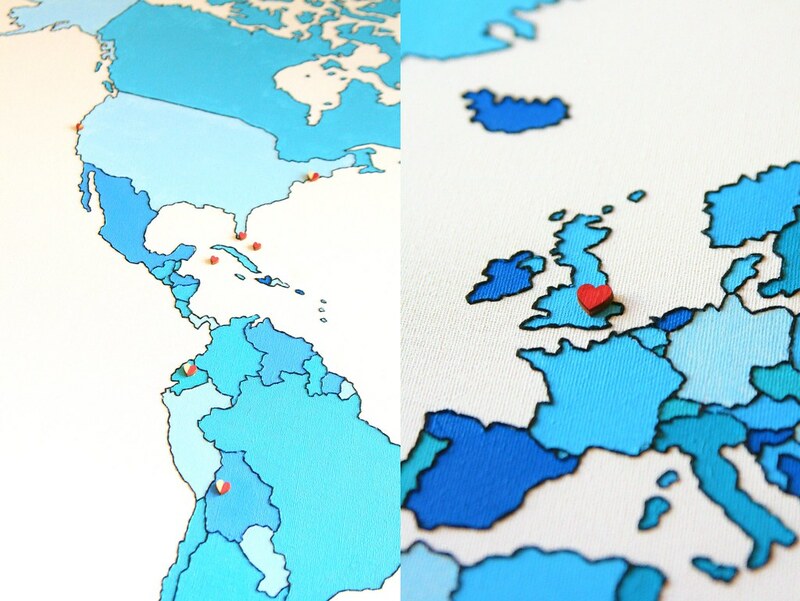 However, I didn't want to use different colours or shapes because I want the map to keep its clean, graphic, blue tonal feel with just little pops of red standing out as map markers. Using the hearts gives me a perfect way to do this. 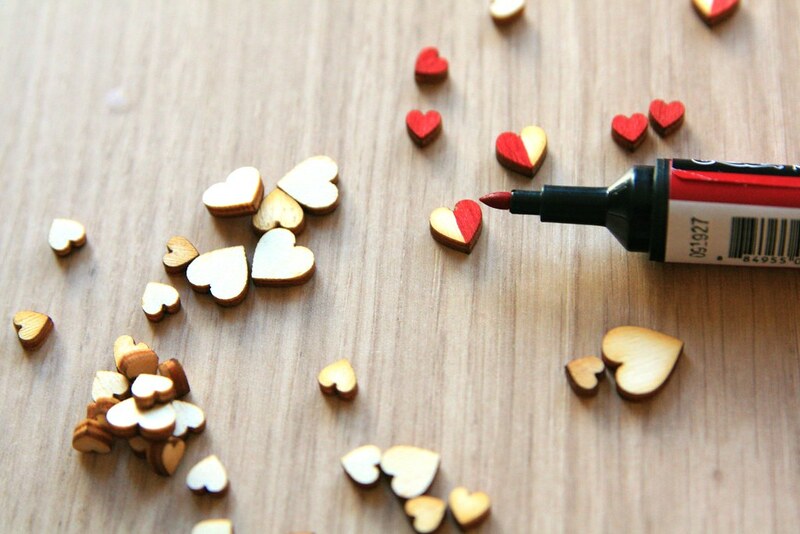 I picked up a deep red felt tip marker from an art shop and coloured in the little wooden hearts as I added them. 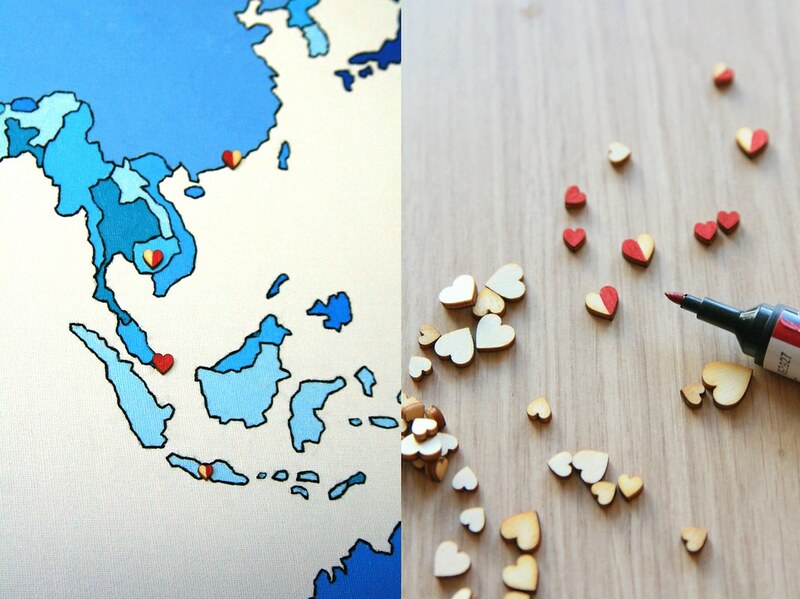 I coloured in the right hand side to mark places I've been, the left had side represents countries the man has visited, and completely red hearts are places we have both explored. The nice this about this system is that I can update it as I go along. For instance, the man has already been to Iceland, but I will be leading a Girlguiding trip there in April. Once I've visited, I don't need to pull anything off the map, or faff around changing things: I can just colour in the other half of the heart. All that remained was to start gluing them on! I've got a few left to do, but it's lovely to get the last phase of this project complete. In the past year, I have been hugely fortunate and visited Singapore, Indonesia, Berlin, Poland, Ecuador and Bolivia, and I very much hope there will be new countries and cultures to explore this year. P.S. Also excited to get this up on the wall! That is a really cool project!